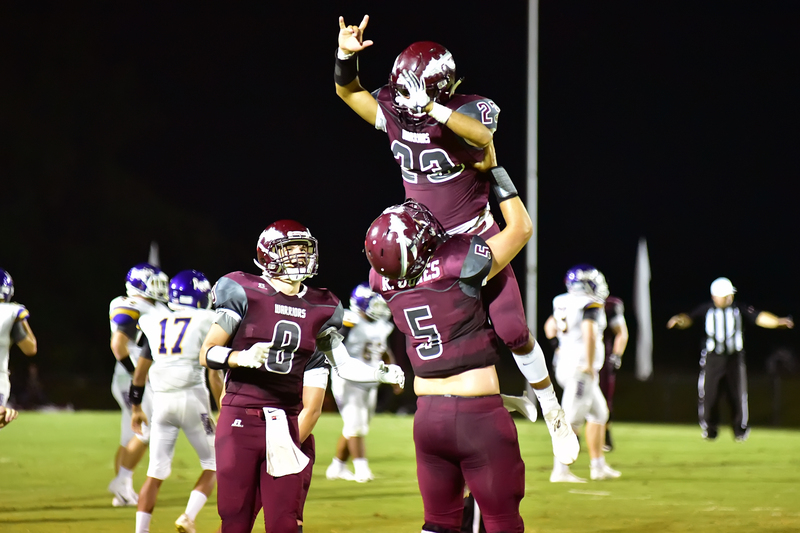 WEST POINT– It was perfect weather for the opening game of the season as the West Point Warriors (5A, Region 7) played host to the Fairview Aggies (4A, Region 7) in the second annual Brandin’ Iron Bowl. The hometown Warriors cruised to a 55-27 victory. The Aggies received the opening kickoff only to go three-and-out; however, the Warriors’ offense seemed to be clicking on all cylinders right out of the gate. West Point marched 60 yards on 10 plays, capping it off with a 6-yard touchdown run by Hunter Persall to give the home team an early 6-0 lead. It didn’t take long for the Aggies to respond; on the ensuing kickoff Fairview’s Dante Dumas took it 88 yards to tie the game at 6 with 5:58 remaining in the first quarter. The Warriors got the ball back looking to duplicate the result of their first drive. This time they went on a 13-play drive that ended with another touchdown after Brayden Martin scored from 2 yards out. Rylan Jones tacked on the 2-point conversion to give the Warriors a 14-6 lead with 1:27 remaining in the opening quarter. After forcing another three-and-out the Warriors’ offense continued its impressive start thanks to a 27-yard touchdown pass from Jones to Kobe Bowers putting the West Point up 20-6 early in the second quarter. Again, the Warrior defense stepped up to force another punt. Faced with a third-and-long Jones found Bowers for 21 yards, keeping the Warriors’ drive alive. The very next play Jones called his own number as he scampered for a 7-yard touchdown putting the Warriors up 27-6 with five and a half minutes to go before halftime. The Aggies had the Warriors’ defense on its heels as they looked to cut into the lead, but Levi Farley put an end to that when he intercepted to ball in the end zone. This time it was the Aggies’ turn to step up, and they did just that, forcing the Warriors to go three-and-out. The Aggies didn’t seem to have an answer for the Warrior defense; Steven Rodriguez intercepted the first-down pass. This time the Warriors capitalized on the short field; with 1:02 before halftime, Persall added to the Warriors’ lead when he broke off a 27-yard touchdown run to make it 34-6, the score as both teams headed to the locker room. The Aggies seemed to catch a break when they forced a fumble and recovered it on the opening kickoff of the second half, which set their offense up with great field position. But once again the stingy Warriors defense rose to the occasion when Farley got his second interception of the game. On the very next play Persall capitalized with a 66-yard touchdown run, putting the Warriors up 41-6 with 9:30 left in the third quarter. The Aggies continued to fight, cutting the deficit to 41-13 midway thru the third quarter thanks to a 6-yard touchdown from the legs of Dayne Black. West Point answered with another score early in the fourth when Jones found Kolton Sapp for a 19-yard touchdown on fourth down, pushing the lead to 48-13. The Aggies’ Mason Black was still running hard when he found the end zone from 5 yards out with 7:51 left in the game, which cut the lead to 48-20. Black wasn’t the only one running hard; several plays later West Point’s Kelton Washington busted through the hole for a 58-yard touchdown run extending the Warriors’ lead to 55-20 with 6:05 left to play. Late in the game, 23 seconds to go, Parker Martin gave the Aggies another touchdown on a 4-yard run. The late score made the final score 55-27. Farley said he doesn’t have to worry about his Warriors becoming complacent.